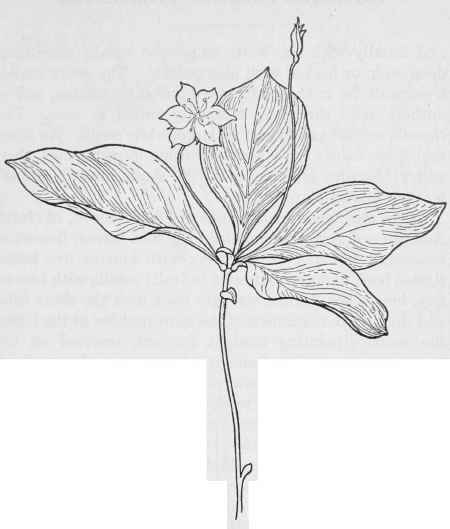 A little woodland plant, with a slender stem, from three to six inches tall, bearing at the top a circle of from four to six, smooth, bright green leaves and one or two, threadlike flower-stalks, each tipped with a delicate flower. The corolla is about half an inch across, wheel-shaped, with no tube and usually with six, white or pinkish petals, sometimes deep pink, or flecked with lilac outside. The ovary makes a purplish dot in the center, surrounded by curling, yellow anthers, with threadlike filaments united at base. The capsule contains a few, rather large, white seeds. We often find these dainty little plants growing in companies, their starry blossoms glimmering in the shade, prettily set off by their neat circle of leaves. There are a good many kinds of Dodecatheon, of North America and Asia; perennials, with root-leaves; flowers in bracted, terminal clusters; calyx with four or five lobes, turned back in flower but erect in fruit; corolla with four or five, long lobes, turned strongly back over the short tube and thick throat; stamens of the same number as the lobes, the anthers pointing straight forward, inserted on the throat of the corolla, filaments short, flat and united, or lacking; style long; capsule containing many seeds. The Greek name, meaning "twelve gods," seems far-fetched, but Linnaeus fancied the cluster of flowers resembled a little assembly of divinities. Common names are Prairie Pointers, Mosquito-bills, Wild Cyclamen, and American Cowslip, the latter poor, because misleading.